Are you looking for someone to help clean your home? Give the cleaning professionals at Sears Maid Service a call. We have teams of professionals ready to help with your residential and commercial cleaning needs. Whether you need a one-time deep cleaning visit or want to have someone come on a regular basis, your locally-operated Sears Maid professionals can do the job. Our teams work on baths, kitchens, halls, bedrooms, family rooms, and any other room you have. Toilets, microwaves, ceiling fans and ovens: we clean them all. Give us a call at (855) 412-8798. Bringing in someone to help with your regular house cleaning can help take some stress out of your busy schedule. If you are looking for someone to come in to clean your home, Sears Maid Services can help. Our home cleaning professionals can come in at a time that is convenient to your schedule. We offer weekly, bi-weekly and monthly cleaning for your convenience. Do you need a one-time deep cleaning? Our intensive Deep Cleaning service is the perfect solution. We perform all of our usual cleaning services while giving additional attention to certain areas of your home. What does your office space say about your company? Your office space reflects your company's priorities to your clients, staff, and vendors. A dirty office space does not reflect well on your company. It also demoralizes your employees. A clean office, on the other hand, indicates order and precision. It also boosts employee morale. Don't let your office space get cluttered and unsanitary. Regular cleaning, with the help of Sears Maid Services professionals, ensures your office will stay clean and tidy. All of our employees receive advanced training on how to keep office spaces clean. 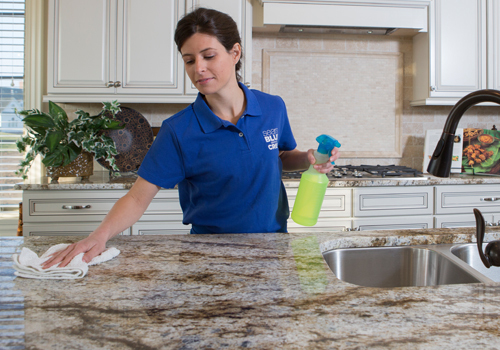 We do everything from removing dust to scrubbing kitchen stains to emptying waste baskets. Building a home can be quite a messy endeavor. Dust and debris get virtually everywhere. Once construction is done, most rooms will need a good scrubbing before the newly constructed home is presentable to realtors, potential buyers, or home inspectors. If you need help cleaning a house after the work is done, call on the post-construction cleaning services offered by Sears Maid Services professionals. Our professional house cleaners have extensive experience cleaning up the mess left behind after construction. We remove dust and debris from the entire interior. We vacuum, sweep and mop all the floors. Once clean, we sanitize all surfaces. The result is an impressively clean, sanitary house that is ready to be presented. Bringing someone into your home to handle the cleaning can be uncomfortable for some people. Your home is your safe haven and personal space. Here at Sears Maid Service, we understand this. That is why we put professional integrity and expertise at the heart of our services. We know that offering home cleaning services means more than just doing the work well. It means establishing trusted relationships with each of our clients. All of our prospective employees undergo a rigorous background check during the hiring process. We want to maintain a professional and trustworthy relationship. Each new hire goes through an extensive training program, both onsite and offsite. This program helps develop each employee's knowledge and skills to deliver consistently excellent results for each of our clients. We take pride in the quality of the services we offer. That is why we guarantee our results. If you are not satisfied with our cleaning service, let us know within 24 hours of your last cleaning. We will send an associate out to inspect the results. If we missed something, we will correct that mistake at no extra charge to you.